This section describes the importance of sleep to everyone, not just athletes. We hope we have covered most topics you will come across regarding sleep, and that after reading this section you will be more informed as to the benefits of a good, uninterrupted deep-sleep. Most importantly, we hope to drive the message that you should ensure you get adequate sleep every day. Sleep is a natural and periodic state of rest during which consciousness of the world is suspended. Sleep is also marked by lessened movement of the skeletal muscles and slowed-down metabolism. We are aware that people exist who seem in a “world of their own” and don’t do very much day to day but they aren’t sleeping! What goes on when we sleep? Scientists know that the brain is incredibly active during sleep because they can measure brain activity using an electroencephalograph or EEG. Additionally, they can record muscle activity during sleep using an electromyogram (EMG) and monitor eye movements with an electroculogram (EOG). In 1953 neuroscientists discovered a physiological state which occurs periodically during sleep (approx. every 90 minutes). There is a heightened brain activation during this time including a burst of rapid eye movement (REM), increased breathing and heart rate, genital arousal, and paralysis of bodily movement; the person is highly aroused yet fast asleep! During sleep, we usually pass through five stages: stages 1, 2, 3, 4, and REM sleep. These stages progress in a cycle from stage 1 to REM sleep, then the cycle starts over again with stage 1. In an eight hour period of sleep the brain cycles through theses stages 4 or 5 times. We spend almost 50% of our total sleep time in stage 2 sleep, about 20 % in REM sleep, and the remaining 30% in the other stages. Infants, by contrast, spend about half of their sleep time in REM sleep. Stage 1 sleep (drowsiness): We drift in and out of sleep for about 5 to 10 minutes and can be awakened easily. Our eyes move very slowly and muscle activity slows. 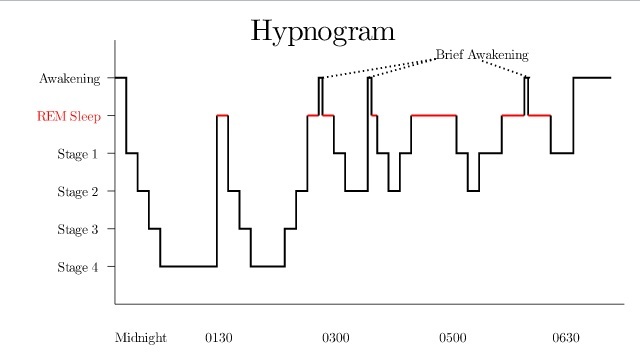 Stage 2 (light sleep): Our eye movements stop and our brain waves become slower, with occasional bursts of rapid waves which are called “sleep spindles”. Our heart rate slows and body temperature decreases. Stages 3 and 4 (deep sleep): In stage 3 sleep, extremely slow brain waves called “delta waves” begin to appear, interspersed with smaller, faster waves. By Stage 4, the brain produces delta waves almost exclusively. It is very difficult to wake someone during stages 3 and 4, which together are called deep sleep. There is no eye movement or muscle activity. People awakened during deep sleep do not adjust immediately and often feel groggy and disoriented for several minutes after they wake up. REM sleep: During REM sleep, our breathing becomes more rapid, irregular, and shallow, our eyes jerk rapidly in various directions, and our limb muscles become temporarily paralysed. Our heart rate increases, our blood pressure rises (and males develop penile erections!). People dream during this stage. The first REM sleep period usually occurs about 70 to 90 minutes after we fall asleep. The first sleep cycle each night contains relatively short REM periods and long periods of deep sleep. As the night progresses, REM sleep periods increase in length while deep sleep decreases. By morning, people spend nearly all their sleep time in stages 1, 2, and REM. We would like to make clear to men who are easily aroused that the excuse, “I’m in a REM sate” doesn’t usually wash well with others! Why sleep is important and what it does for us. Sleep is necessary for our nervous systems to work properly. Without enough sleep you will be drowsy and unable to concentrate the next day. It leads to impaired memory and (perhaps most relevant) reduced physical performance. If sleep deprivation continues, hallucinations and mood swings may develop. Deep sleep coincides with the release of growth hormone. Many of the body’s cells increase production and reduce breakdown of proteins during deep sleep and since proteins are the building blocks needed for cell growth and repair, deep sleep may truly be “beauty sleep”; at least in a muscle building sense. Activity in parts of the brain that control emotion, decision-making and social interaction is drastically reduced during deep sleep; suggesting that this type of sleep may help people maintain optimal emotional and social functioning while they are awake. The amount of sleep each person needs depends on many factors, including age. Teenagers need about 9 hours on average. For most adults, 7 to 8 hours a night appears to be the best amount of sleep, although some people may need as few as 5 hours or as many as 10 hours of sleep each day. Strength athletes and bodybuilders are known to sleep any chance they get. Sleep is very important to these athletes to help the rate of recuperation. It is common practice for these athletes to have a split sleep pattern which consists of an afternoon nap for 2 hours and a longer sleep at night (6 -10 hours). The amount of sleep a person needs also increases if he or she has been deprived of sleep in previous days. Getting too little sleep creates a “sleep debt”, which is much like being overdrawn at a bank. Eventually, your body will demand that the debt be repaid. An important fact is that we never adapt to getting less sleep than we need; while we may get used to a sleep-depriving schedule, it carries the penalty of our judgment, reaction time, and other functions being impaired. Experts say that if you feel drowsy during the day, even during boring activities, you haven’t had enough sleep. If you routinely fall asleep within 5 minutes of lying down, you probably have severe sleep deprivation, possibly even a sleep disorder? Brief episodes of sleep are called “Microsleeps”. In many cases, people are not aware that they are experiencing microsleeps. The widespread practice of “burning the candle at both ends” in western industrialised societies has created so much sleep deprivation that what is really abnormal sleepiness is now almost the norm. Sleep-deprived people who are tested by using a driving simulator or by performing a hand-eye coordination task perform as badly as or worse than those who are intoxicated. Sleep deprivation also magnifies alcohol’s effects on the body, so a fatigued person who drinks will become much more impaired than someone who is well-rested. Since drowsiness is the brain’s last step before falling asleep, driving while drowsy can, and often does, lead to disaster. Caffeine and other stimulants may help with drowsiness, but they cannot overcome the effects of severe sleep deprivation. How is sleep affected by caffeine, ephedrine, medications, heavy smoking and alcohol? Since sleep and wakefulness are influenced by different neurotransmitter signals in the brain, foods and medicines that change the balance of these signals affect whether we feel alert or drowsy (and how well we sleep). Caffeinated drinks such as coffee, drugs such as ephedrine (and other stimulant containing diet pills) and decongestants stimulate some parts of the brain and can cause insomnia (an inability to sleep). Many antidepressants suppress REM sleep. Heavy smokers often sleep very lightly and have reduced amounts of REM sleep. They also tend to wake up after 3 or 4 hours of sleep due to nicotine withdrawal. Many people who suffer from insomnia try to solve the problem with alcohol; the so-called night cap. While alcohol does help people fall into light sleep, it also robs them of REM and the deeper, more restorative stages of sleep. Instead, it keeps them in the lighter stages of sleep, from which they can be awakened easily. What are dreams, and is dreaming and REM sleep synonymous? Of people awakened during REM sleep, as many as 70-95% of them report dreams in contrast to 5% -10% of awakenings during non-REM sleep. This led neuroscientists to assume that REM and dreaming are synonymous and that dreams are meaningless conscious images triggered by signals sent by the brain stem. We hope that reporting this fact has not angered those who believe dreams have a greater meaning. For those who have sleep trouble, we hope now you will take steps to improve your sleep pattern and ultimately give your body the time it needs to grow and repair. Once you develop a pattern you will find your sleep will be improved. Many people are stressed from family, work or other personal issues and often lie awake staring at the ceiling looking for a solution of some sort. Sadly, these overactive minds are depriving you of your much needed sleep. We suggest you find some way to relax and calm you mind so that you can get a good sleep. The fact of the matter is you will be able to tackle problems and work-loads better after a good refreshing sleep. If trying to relax seems impossible remember this statement; “if there’s a problem, stressing doesn’t help and if there’s no problem, there’s no need to stress”. So, try to clear your head and put off all the problems till the morning, only after you’ve had a good, uninterrupted 8 hour sleep… Sweet dreams!